In describing the career of Abraham Yagel, a Jewish physician, kabbalist, and naturalist who lived in northern Italy from 1553 to about 1623, David Ruderman observes the remarkable interplay between early modern scientific thought and religious and occult traditions from a wholly new perspective: that of Jewish intellectual life. Whether he was writing about astronomical discoveries, demons, marvelous creatures and prodigies of nature, the uses of magic, or reincarnation, Yagel made a consistent effort to integrate empirical study of nature with kabbalistic and rabbinic learning. Yagel's several interests were united in his belief in the interconnectedness of all thing-a belief, shared by many Renaissance thinkers, that turns natural phenomena into "signatures" of the divine unity of all things. Ruderman argues that Yagel and his coreligionists were predisposed to this prevalent view because of occult strains in traditional Jewish thought He also suggests that underlying Yagel's passion for integrating and correlating all knowledge was a powerful psychological need to gain cultural respect and acceptance for himself and for his entire community, especially in a period of increased anti-Semitic agitation in Italy. 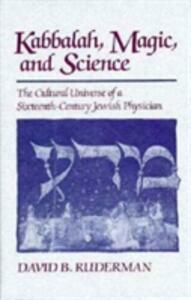 Yagel proposed a bold new agenda for Jewish culture that underscored the religious value of the study of nature, reformulated kabbalist traditions in the language of scientific discourse so as to promote them as the highest form of human knowledge, and advocated the legitimate role of the magical arts as the ultimate expression of human creativity in Judaism. This portrait of Yagel and his intellectual world will well serve all students of late Renaissance and early modern Europe.